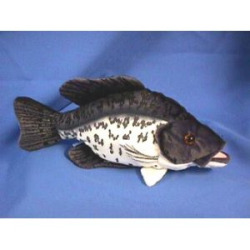 This Black Crappie Fish is produced by Cabin Critters and has great detailing. The coloring and patterns on the fish's body also add a realistic effect. The fish is soft and also is bean-filled. The Black Crappie Fish makes an excellent gift for fans of fish!